The Bosch CORE18V 6.3 AH battery – here’s another product that’s been shown at this year’s World Of Concrete trade show in Las Vegas. 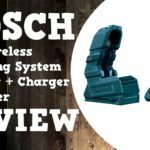 So we already know Bosch has 18V 6.0 ah batteries, after all they were included with the Bosch Bulldog 18V EC Brushless SDS Plus 1″ Rotary Hammer GBH18V-26K that I reviewed recently. 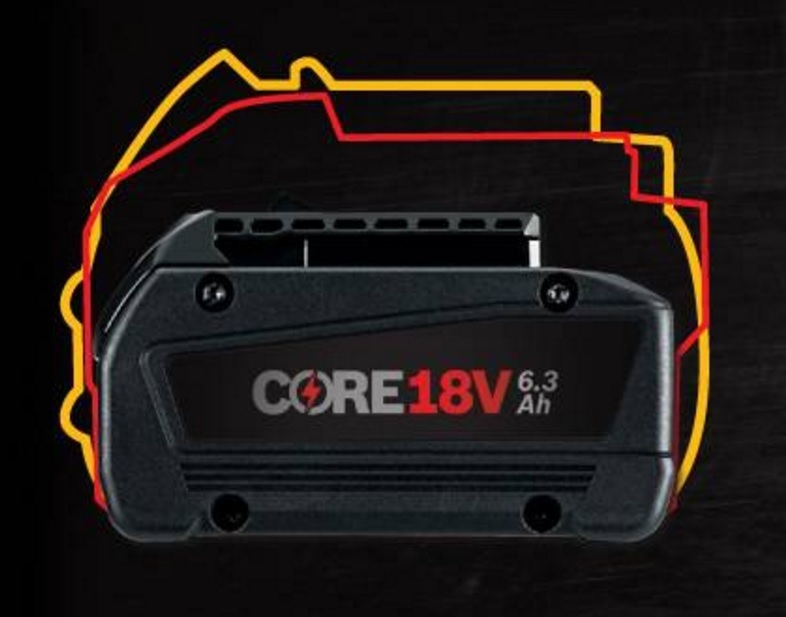 The question is why make an 18V 6.3 ah battery when they already have a 6.0 ah battery? 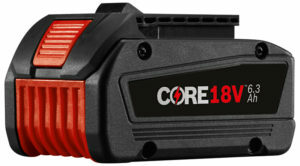 The answer is simple, the new Bosch CORE18V 6.3 Ah Battery employs several improvements. They use newer larger 20700 cells that according to Bosch will provide more performance, longer runtime, longer life, and run cooler thanks to new CoolPack 2.0 technology. The Bosch CORE18V Battery offers optimized cell technology and an improved power connector within the 10 high-density cells that ensure lower internal resistance. That means higher currents can be drawn from the cells over a longer period of time. The battery employs advanced Lithium-ion technology to deliver 80 percent more power than previous generation Bosch batteries. Next-generation, high-powered Bosch CORE18V cells are laser-welded and rail-connected for high efficiency, allowing CORE18V batteries to deliver better performance than competitive batteries that have up to 24 percent more weight and are up to 35 percent larger. The battery housing of Bosch CORE18V is designed to transfer more heat to the outer surface, resulting in up to 35 percent better cooling effect than previous CoolPack batteries. The CoolPack 2.0 system employs advanced design to keep the battery cooler for better runtime and longer life; updated CoolPack technology provides up to 135 percent longer battery life than batteries that don’t have CoolPack technology. 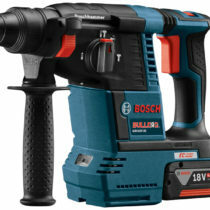 The individual battery cells are larger than traditional 18650 cells use in current batteries making the new Bosch CORE18V 6.3 Ah Battery considerably larger than current Bosch 18V FatPack batteries. This is because Bosch is using the newer larger 20700 cells in these new batteries and the claims back them up as other brands that use 20700 cells make similar claims. 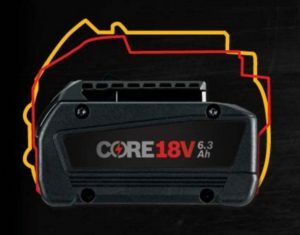 This makes the new Bosch CORE18V 6.3 Ah Battery about almost as long as the Dewalt Flexvolt 6.0 and Milwaukee 18V HD 9.0 batteries but a bit shorter than those because the Bosch Core18V battery is only running 10 cells instead of the 15 of the other two batteries. This means that the Bosch CORE18V 6.3 Ah Battery is running a more traditional cell configuration of 2 rows of 5 cells each. 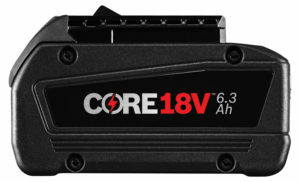 We can also expect the new CORE18V battery to be heavier than traditional fatpack batteries as well. Bosch also mentions that these new batteries charge faster, faster than other brands batteries according to their own comparison claiming an 8 minute charge rate per AH with the use of the CORE18V charger of course. At this rate the new battery should charge in about 48 minutes according to their own statement. That’s very fast if true. Just for a comparison, Makita’s 18V 6.0 ah battery charges in 55 minutes. 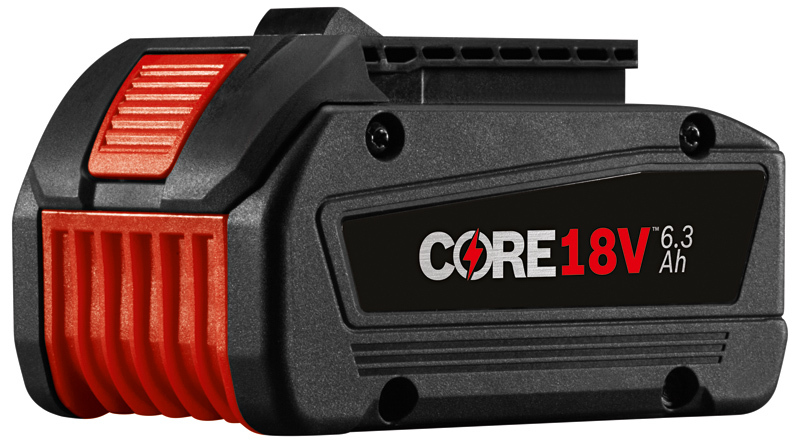 Of course the new Bosch CORE18V 6.3 Ah Battery will be backwards compatible with existing Bosch 18V lithium ion slide pack battery tools. We should be able to expect these new batteries out soon and will retail for about $149 in the US and $199 in Canada.